The hopes of a beauty therapist, Henry Abaigom, to rake in money from customers during the Yuletide were dashed after he was sent to Kirikiri prison because the stretch mark cream he gave two of his customers damaged their skin. According to Punch, Abaigom was arrested by the police on Tuesday in Ikeja for allegedly damaging the skin of two of his customers – 19-year-old Ifeabunike Alexandra and Nikky Imoh, 21. The complainants, who are friends, had engaged Abaigom’s service to remove the stretch marks on their skin, and apply other skin treatments. her knuckles, was asked to pay N106,000. The suspect had reportedly collected sums of N125,000 and N45,000 in advance from Alexandra and Imoh respectively, promising that they would see results shortly after the treatments. Contrary to their expectation, it was gathered that the customers’ skin worsened, but Abaigom insisted on collecting the balance of his fees. The friends, after failed attempts to get their money back, reported the case to the police at the Ikeja division, who arrested the suspect. Alexandra told the police that Abaigom had presented himself on Facebook, through which she contacted him as a qualified beautician, adding that series of tools he displayed on the social media convinced her to seek his service. “I called him (Abiagom) on the telephone and told him what I wanted with my skin, including exfoliation, polishing and stretch mark treatment. It was N166,000 altogether.“I asked him when I would start seeing positive results and he said almost immediately. He requested 75 per cent of the payment and I gave him N125,000.“After the first treatment on December 13, I started having reactions such as rashes, dark eyes and darker skin complexion. He did the treatments for my friend and me at a guesthouse despite claiming to have a shop. He didn’t do most of the treatments I paid for, but he wanted the N41,000 balance.”Imoh stated that she thought she had found a professional in the suspect when Alexandra introduced him to her. “I wanted to clear dark knuckles and have an even skin, which he said he could do. I paid him N45,000 for a start,” she added.Abiagom, who admitted collecting the sums from the friends, however, said they were not patient. 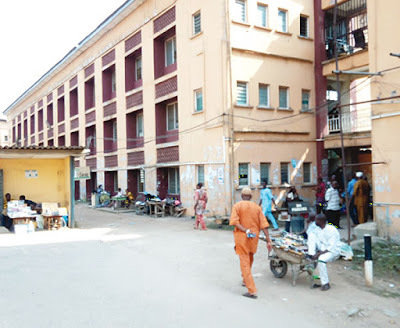 A police prosecutor, Inspector Benedict Aigbokhan, brought the beautician before an Ikeja Magistrate’s Court on two counts of obtaining money under false pretences. “That you, Henry Abiagom, on December 13, at about 2pm, at Quarters 36, Block 2, Oba Akinjobi Street, GRA, Ikeja, in the Lagos Magisterial District, did obtain the sum of N125,000 from one Ifeabunike Alexandra to work on her skin and beautify it, knowing same to be false, thereby committing an offence punishable under Section 312 of the Criminal Law No 11, Vol. 44 Laws of Lagos State.”The defendant, however, pleaded not guilty to the charge and was admitted to bail in the sum of N100,000 with one surety in like sum by the presiding magistrate, Mrs. O.A. Akokhia. The case was adjourned till February 20, 2016.